Tim Gunn, look out. The world's newest budding fashion designer has arrived. She goes by Mayhem. She's 4 and, yes, fabulous. 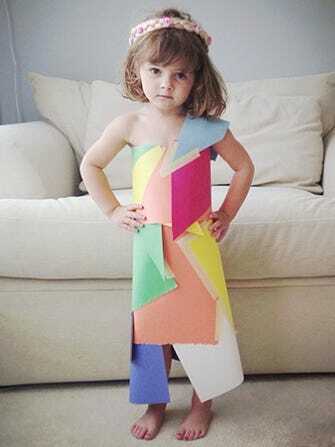 What started as a young girl's love of dress-up has spiraled into a paper-dress house of fashion for mom Angie and daughter, dubbed "Mayhem." Together, they transform paper, tissue, and tape into serious gowns worthy of the runway — on the daily, mind you. And, after nine months of creating, the dresses have become quite advanced, including recreations from awards shows like J. Lawr's controversial white Dior dress (an R29 "Who wore it better?" poll named Miss M. the clear winner) and Lupita Nyong'o's red Ralph Lauren Golden Globes look. Yet, we must note that her earliest pieces reveal a true aesthetic genius, like in the colorblocked, one-shoulder number with a front slit pictured here. Perhaps it's unintentional, but its particular color placement and combinations echo Tibi (specifically, this look Eva Chen sported last week). However, she's not out to please the masses, folks. Also, the attitude. Whether she's "hair flipping" (she only recently learned what this is), eye-rolling, or taking jumping shots, she nails it, every time.